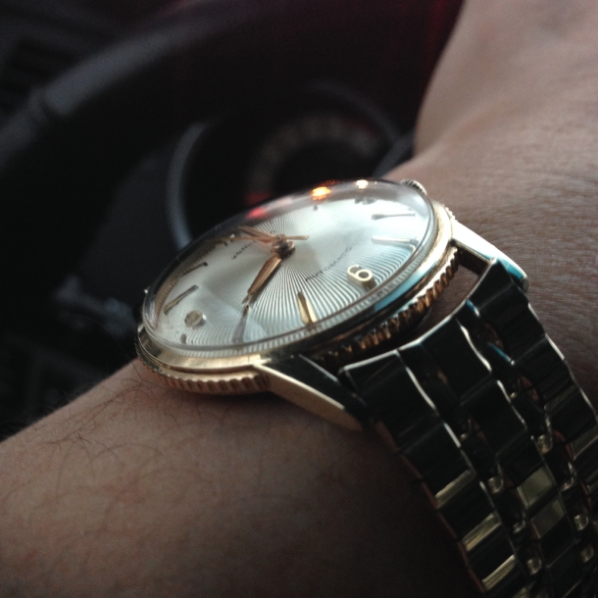 I know of three Hamilton watch models that feature reeded edges - like a coin. Two of them you see more frequently than the third. The most common is the 1935 Boone. A somewhat rarer reeded-edge watch is appropriately named the 1969 Liberty Coin. It has the distinction of being the last US-production watch. 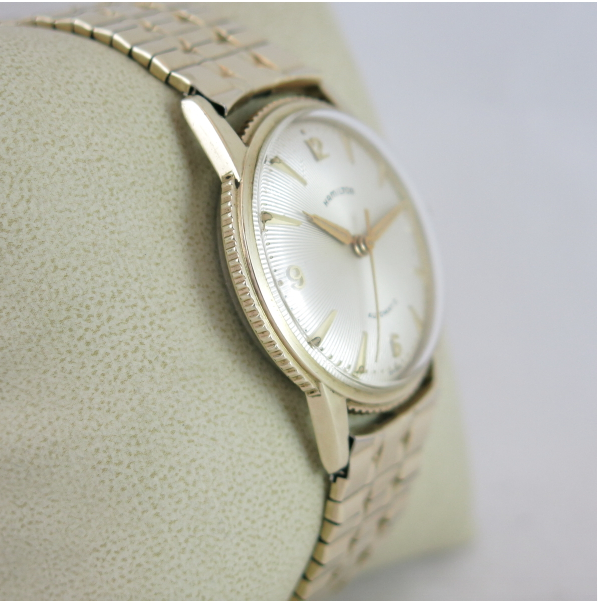 The third watch with a reeded edge is the 1959 Accumatic VII. 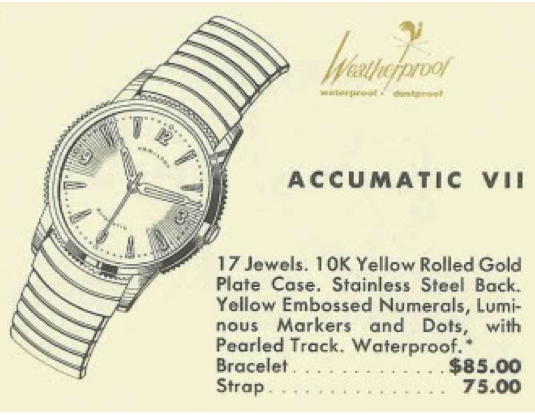 The Accumatic VII was produced for only two years. It features a 17 jewel, Swiss-made Hamilton 672 movement. The case is 10K yellow RGP with a snap-on stainless steel back. The dial is fancy with radiating grooves extending from the center and pearlized dots making up the minutes track. The catalog says the numerals and markers are embossed but they look like applied gold markers to me, as you will see below. 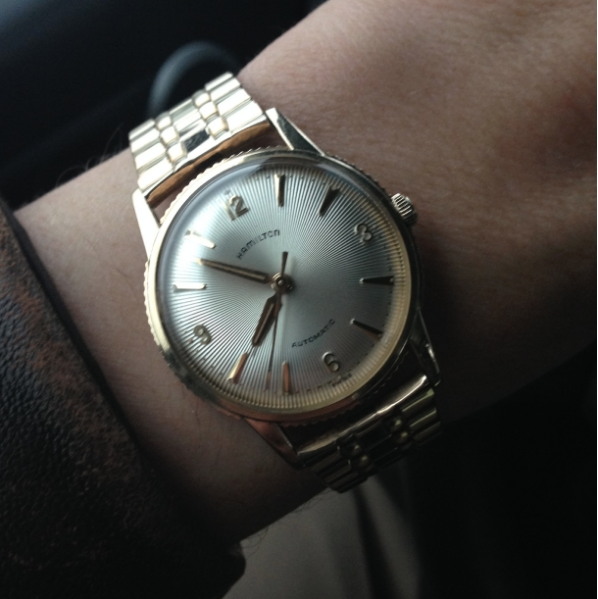 I recently picked up a Accumatic VII - it's the only one that I have ever seen for sale so I dug a little deeper than I usually do for a watch. It was advertised as recently serviced and based on how it looks, both in person and on my timer, I would believe it. 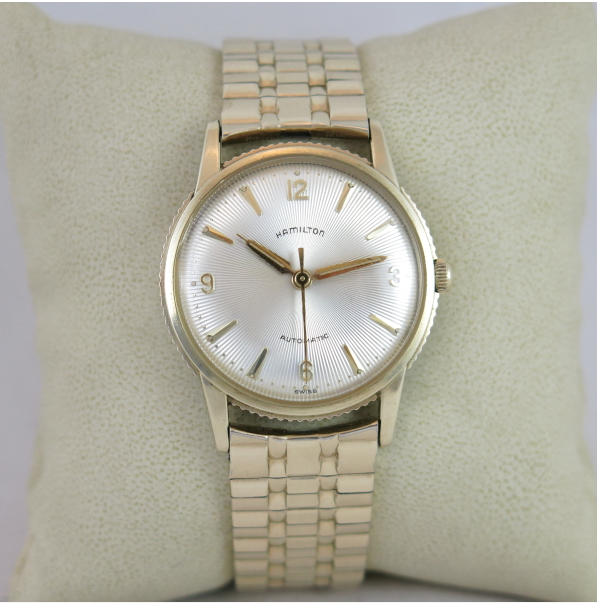 The bracelet on this particular watch is not the original style shown in the catalogs but it is period correct. Between the bold features of the dial, the case and the bracelet, this watch has a lot going on as far as eye candy. Check out the number 6 and the hour markers below… do these look like embossed (stamped) figures to you? Me neither. Beautiful watch, what size is the case. It photographs large (which I like). It's about 32mm wide excluding the crown and 39mm lug tip to tip. That's consistent with most automatics in Hamiltons line up from the 1950's and 60's. Some a little bigger, same 1mm smaller but generally this range. The crown should have an H. The crystal isn't that special... and GS PHD (high dome) will work as long as the diameter is correct. The bracelet is not likely to be a Speidel - Hamilton used mostly Kreisler and JB Champion along with a few others but rarely Speidel. What size band fit it?